About Wood Logs Scotland Ltd.
Wood Logs Scotland Ltd. is a firewood merchant and log delivery company serving Glasgow, Edinburgh and the Central Belt of Scotland. We are suppliers of kiln-dried firewood and seasoned firewood fuel for your open fire, woodburner, wood burning stove, multi-fuel stove, chiminea or solid fuel range, delivered promptly to your door or log store There is a special type of atmosphere that only a log fire can bring and with the price volatility of other types of fuels logs make economic sense as well as a comforting feature in your home. We have endeavoured to source all of your logs from Scotland. The current demand for firewood throughout the country means we have had to go further afield. We can say however that the majority of the firewood we supply is Scottish and from within 2 hours drive of our depot. The idea of using a sustainable and renewable fuel to heat our homes and businesses has driven the recent revival of wood burning. The timber for your logs is grown in Scotland as locally as we can source it from managed forests, and occasionally from outwith the UK to meet demand. This is better for the environment and better for all our pockets. We are using wood that was always intended for commercial purposes and that has travelled the shortest distance possible. This helps you to reduce the environmental impact of staying warm. Not only do we believe in the product but we believe in customer service. We know what it is like to be a customer, waiting for a delivery. We want to make sure you get a good quality product at a time that suits you, rather than waiting around wondering when your logs will be delivered! We want you to be happy and confident with our wood fuel service and become a regular customer. We know that firewood with a moisture content below 20%.is best for your woodburner stove and chimney flue The moisture level is the difference between having a smouldering lifeless apology for a fire and a bright crackling heartwarming blaze. At below 20% moisture you optimise the efficiency of your stove or fire, as very little energy is wasted evaporating water content. 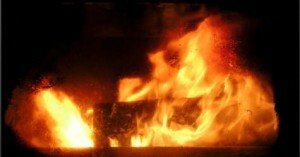 The result is an easy to light, easy to burn log with a high heat output to warm your toes on the coldest winter day. Using a moisture meter, we check the moisture content of every bulk bag, bulk trailer load and handy size net before delivery, to guarantee we bring you the best quality wood fuel.